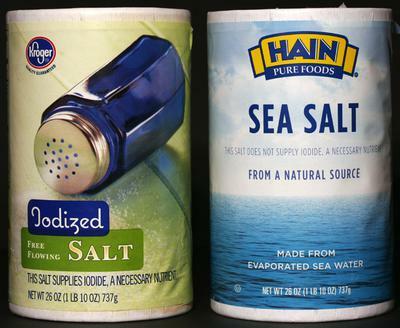 uniodized salt vs iodized salt? I buy Hardy Farms Peanuts Hawkinsville Georgia. Best dawg gone boiled peanuts ever. you can buy them at stands in many places in south and south west Georgia already boiled good and hot and ready to eat. The folks with the stand at Striplins Meat market where I buy my meat and Miss Paula Deen buys hers as well when she's down around home. (she's from Albany ga.)well they even give you a little brown bag to put your shells in cause they know those nuts aint all gonna make it home. well the recipe on the orange net sack says to use uniodized salt (like Kosher salt, its not got iodine in it.) but I was wondering why? I have used just regular ole table sale that has iodine in it cause well i didn't think i required a recipe i mean after all its water, salt, peanuts a big ole pan and heat. so... but this time i used the kosher salt since i know it doesn't have iodine added to it. wonder why they want you to use the salt with out the iodine? just curious. I may call Hardy Farms tomorrow and ask. They are really nice folks its Georgia so....southern hospitality. I was just wonderin if anyone knew why to use the other salt. thanks enjoy your boiled peanuts. Comments for uniodized salt vs iodized salt? Bottom line, if you like the way your boiled peanuts taste, then it doesn't matter what kind of salt you use when boiling them. Iodine is added to salt for nutritional reasons. Our thyroid gland requires iodine for proper function. Iodine was added to salt starting in 1924, in attempt to reduce the rate of goiter, an enlargement of the thyroid gland. Some people are sensitive to the taste of iodine. It has a strong metallic taste. For them it is distasteful. There are many different tastes in salts. Choose the salt that you like, and that's available to you. Thanks! That was really bugging the heck out of me.